A skilled surgeon, Dr. Smith specialized in horses. He had a solid reputation for horse surgeries, including extreme cases of stifles and colic. Other veterinarians would send him their clients or call Dr. Smith for advice. Dr. Smith vetted the animals of other veterinarians as well. Clients would bring their horses from all parts of Ohio, Pennsylvania, West Virginia, and sometimes further. Of course, not every emergency that came across the Milliron Clinic bridge would result in a successful surgery. Most often, horse owners (or a few pet owners in general), would wait until the very last minute before bringing their animal to Dr. Smith for treatment, which played a role in resuscitation and recovery. 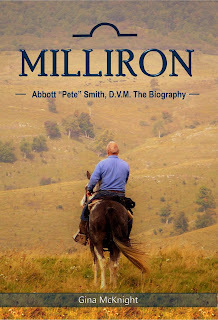 Sometimes, horses would travel so far that by the time they arrived at Milliron Clinic, they were on the edge of death. It’s 9 a.m. and Dr. Pete Smith is walking down the hill from his home to his office. The parking lot is already stacked with cars loaded with small animals of all sorts and their owners of all sorts. Thus begins another routine day at Milliron Clinic, known and respected far and wide throughout Ohio and neighboring states. Dr. Pete never turned away any two-leggeds or four-leggeds. His heart knows no bounds. All morning the small animals are treated. Meanwhile, the parking lot is filling up with horse trailers from far and near. Is it any wonder that Dr. Pete has no time for farm calls? He is well-known to successfully perform major surgery on horses and small animals as well as treat all sorts of wounds, ailments, conditions of age and genetics, fractures and basic routine care. Is he able to trudge back up the hill to home by 9 p.m.? Not always. This is one very dedicated man, deeply loved and supported by wife Jody, children Pat and Jessica, grandchildren and thousands of grateful owners. Several of my animals have benefited from Dr. Pete’s expert care, and I hold dear many fond memories of those occasions. One day he was treating my beloved seventeen-year-old Australian shepherd Lucas while also working with my Tennessee Walker Lady. He said I could hang out backstage while he juggled my two, plus a clinic full of others. It was thrilling to watch Doc dash to and fro, checking Lucas’ X-rays, doctoring Lady in the stall, returning to give Lucas a quick injection as he walked past. It was a frantic beehive of activity with Nanette, Annette, and his very competent staff assisting and reassuring us pet owners. I’ll never forget that day as I was privileged to witness the drama up close and personal. Later, Dr. Pete kindly and gently saw my Lucas and Lady through their final days with care and compassion. He even gave me a much-appreciated hug to comfort me. As Lady was buried on the Milliron property, that spring I desired to see her final resting place. It was a very muddy day as I trudge east through the lumberyard to the location. On the way back, I chose a short-cut – my bad! The mud accumulated on my shoes so heavily that I had to scrape them with a stick every few steps. Ultimately, they were totally buried in ankle-deep mud, and I could do nothing other than to step out of those buried shoes and proceed all the way back in stocking feet! Fortunately, I didn’t step on anything sharp. I was praying hard about it! I told Dr. Pete not to worry if he later found a deserted pair of shoes - the owner survived. This little episode provided a welcome bit of humor into an otherwise sad occasion. Just before Christmas holidays, Dr. Pete tended to a deep abscess in the right rear toe of my Thoroughbred Re-Pete. He invited me to watch as he sat down on an over-turned canister and cut deeply into the profusely bleeding hoof with strength and complete confidence. Meanwhile, I was horrified at the silver dollar size hole in that hoof toe! But, Dr. Pete assured me this had to be done to get all the infection out. Then came my own dilemma – how to manage this wound. I so wanted to go home to Texas for Christmas, and there was no place for the care Re-Pete needed during the holidays. 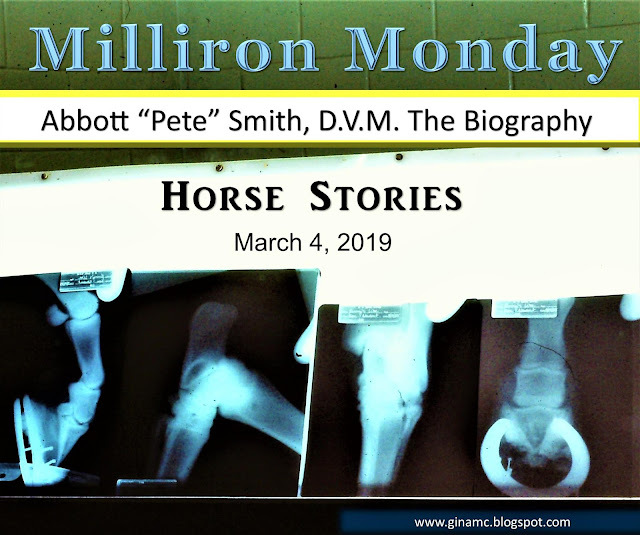 With tremendous generosity, Dr. Pete agreed to board him in the marvelous Milliron stable. The staff, as well as Jody, kept excellent care of Re-Pete for seven weeks. That horse continues sound today due to that top-of-the-line care. Read more horse stories in Tails of a Country Vet. Order here.